I had mild acne as a teen and luckily got over it as I got older. However, I do not have a radiant complexion. I have abused my skin over the years by not wearing the proper sunscreen. One would think a red head living in FL should know better, but I was in fair skin denial until I hit my 30's and realized how important skincare is. I met the people of Tria Beauty at the BlogHer conference and the introduced me to their Tria Blue Light. It is targeted for acne elimination but also improves skin's tone and texture. This sounded like a win win for me! The Tria Blue Light is the same blue light technology found in dermatology offices. Dermatologists have been using blue light in their offices since 2002 as the most effective method for eliminating acne-causing bacteria. I do have a break out from time to time and have actually had the blue light treatment done to me at my dermo's office. I was impressed and intrigued that you can have a blue light at the convienence of your own home. Tria sent me a Skin Perfecting Blue Light to try out for 8 weeks and share my experience with my readers. 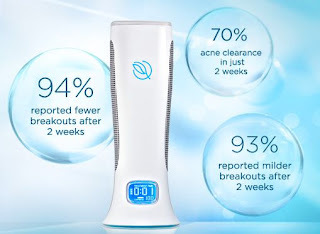 At the end of the eight weeks, I will be giving away a Skin Perfecting Blue Light to one of my lucky readers! So make sure you bookmark my page and read about my journey with the blue light. Rather than sitting on top of the skin, blue light gently penetrates the skin to eliminate bacteria that cause breakouts and dulls complexion. When you eliminate bacteria, you eliminate breakouts and improve the skin's tone and texture, leading to a superior overall complexion. 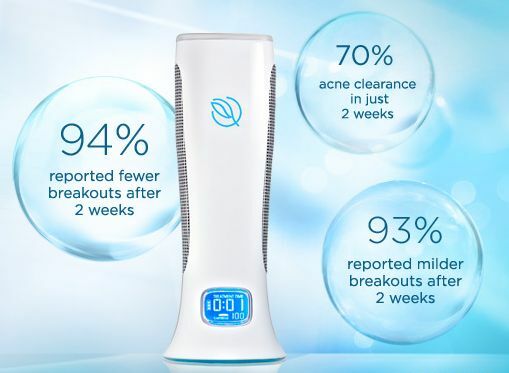 The Tria Blue Light is as effective as professional and prescription treatments yet gentle enough to use daily without irritation, dryness or redness often caused by other acne treatments. See for yourself how the Tria Skin Perfecting Blue Light works to give you a brighter, healthier complexion in just 2 weeks! Very interesting! I never really had acne in high school but unfortunately now that I'm about to turn 30 I have had major breakouts! I've tried just about every OTC brand and even Proactive. However nothing has helped! I would love to try something like this.